If you want to wish your friends or loved-ones well and show them how much you care, let us send this beautiful inspirational present on your behalf. It is the ideal gift for any special event / occasion, particularly a Christian event like Christmas or Easter, or for someone starting a new job or a "new life", travelling afar (for example, as a farewell and safekeeping gift) or even for retirement. Dimensions: Shell measures 28mm in length including the hanging ring, 20mm in width, and comes with a 17.5ins (45cm) black leather cord, fastening with a bolt ring. Alternative option is with 20" sterling silver belcher chain; Please choose when ordering. 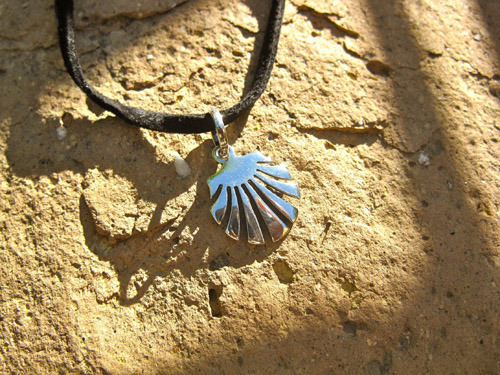 But, whatever somebody’s journey - whether on El Camino itself, on holiday, a business trip, a gap year, trekking, etc, many friends and loved-ones like to pass on a special gift to wish the recipient well on their travels - and protection along the way. A great present to say "I'll miss you" and "take care".